Welcome to free ENRICH computer courses from the Library! Want to use a computer to compose letters or stories? 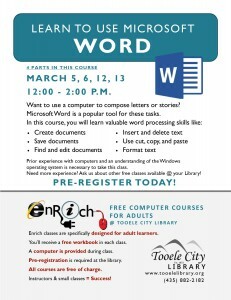 Microsoft Word is a popular tool for these tasks. In this course, you will learn valuable word processing skills like how to: create save, find, and edit documents; insert, delete, and format text.